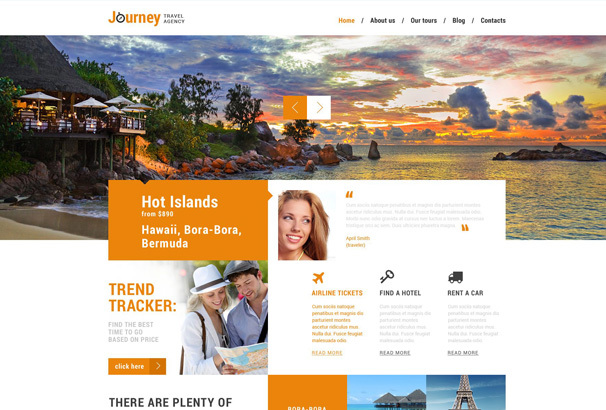 Today we are looking at a range of WordPress Travel Themes, we have split the post up into two sections – the first is for Travel Agency themes which would be suitable for Travel Agents, Tour Operators and other tourism related industries such as resorts and hotels. These themes are designed for businesses and will allow you to showcase your services along with imagery and other important features like booking forms, availability checkers and so on. The second part of this post themes for travel blogs, these are suitable for travel bloggers to keep track of their travels around the world with blog posts and photos. These could also be used to create a blog about a certain destination, country or city – these themes are more like regular blog themes with a design related to travel etc. 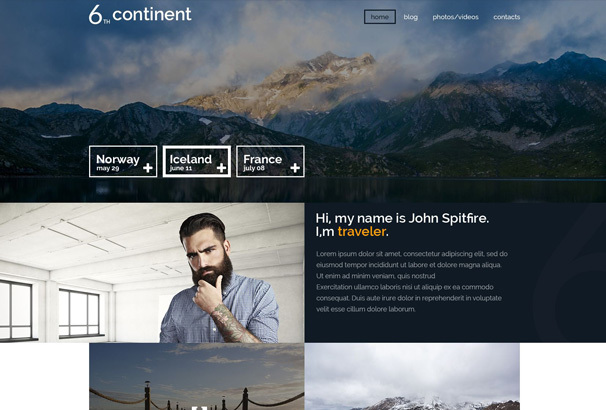 The themes listed here are all hand-picked with nice fresh designs for 2017 following a travel related theme, all you need is a copy of the theme, free copy of WordPress and some good hosting and you can purchase one of these themes and have your travel website up and running in no time at all. The themes listed in this section can be used by travel agencies, tour operators, hotels, resorts and destinations. 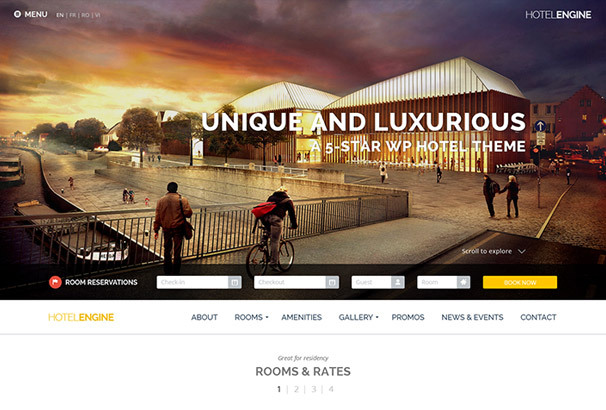 Some of these themes will include extra functionality such as an online booking facility. If you need online bookings, also check out out our guide to booking plugins which will add this feature to any theme. 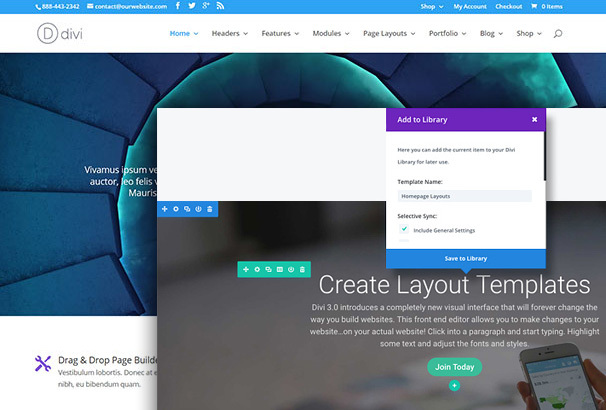 Divi is one of the most powerful WordPress Themes on the market, using the Divi Builder you can visually create any type of website using a drag and drop editor. Create your perfect travel website by simply placing elements on the page where you require them, change colors, fonts, columns and other content modules until you are satisfied and save your new website. No need to hire developers or look at any code – save your own layouts or choose from the many pre-made layouts included with Divi. 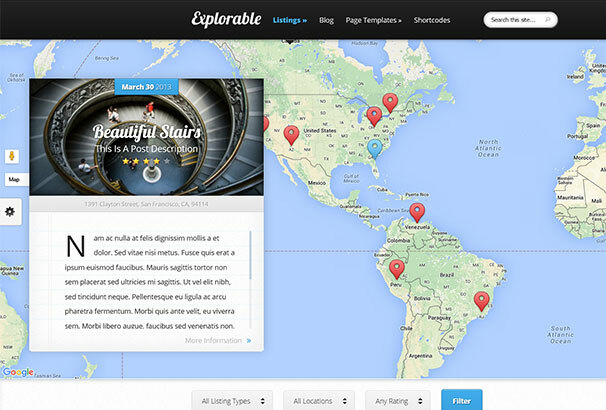 Explorable is a theme by Elegant Themes which is designed around locations – it shows a map of the world and then lets you tag posts to places on the map. Its a perfect theme for travellers who wish to document their journey or for travel guides who would like to write about locations. You could also use it as a business directory, marking out listings on the map. The theme is well-designed and responsive with some great styling options and features that would be needed by travel sites. 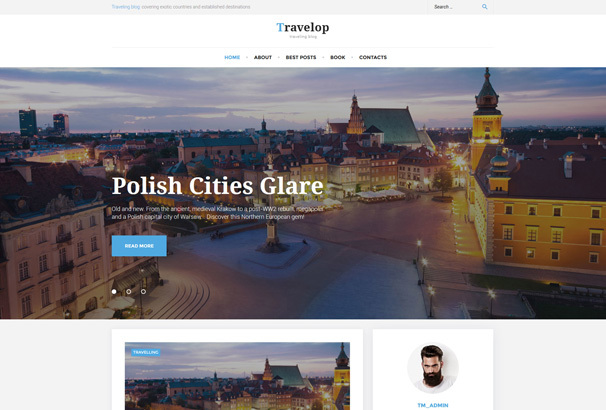 Travelop is a theme for travel bloggers or travel agencies who need a tidy clean and modern WordPress theme. It makes use of the customizer which is packed full of options for you to change the site to suit your needs. 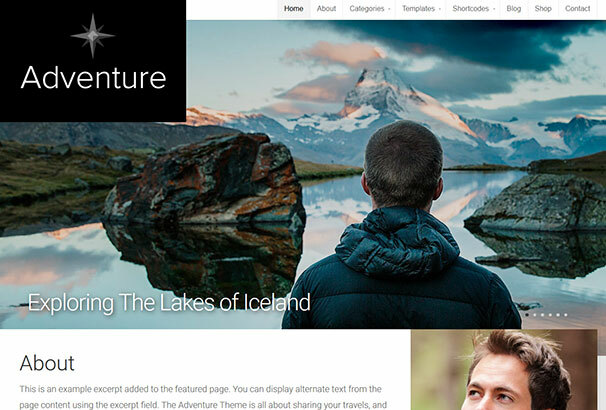 The theme is based on Bootstrap and has Google fonts integration so you can choose from many different font options. 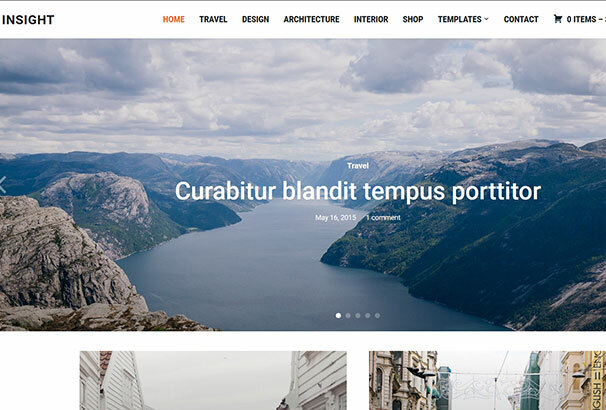 Triptastic is a great looking travel theme which has a whole host of customization options such as a choice of several header, footer and sidebar styles, as well as two blog layouts including mega popular grid and masonry. Use the WordPress customizer to make changes in real-time to your site and tweak it to fit your requirements. 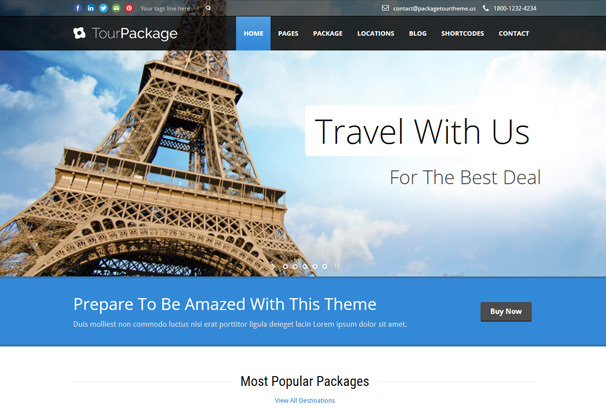 This theme is a well designed theme which is equally useful for travel agencies, tourism companies, travel blogs and more. 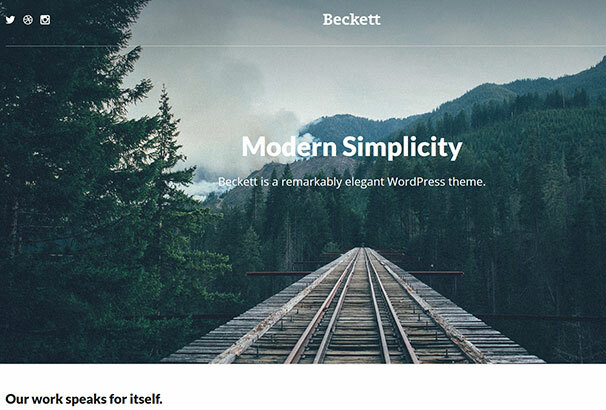 The homepage has a large space for a featured image and it combines well chosen typography with a great layout. 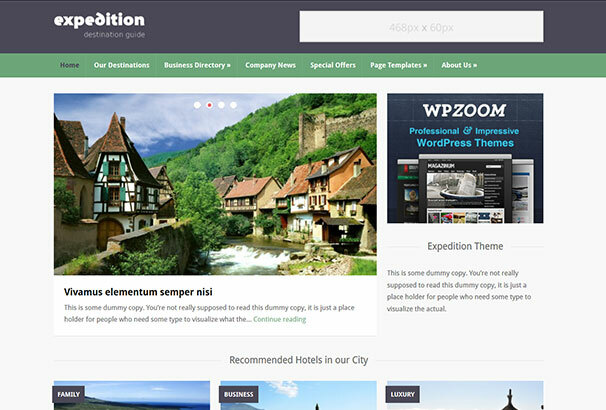 A modern WordPress theme for creating a travel guide or directory – can be used to create a city guide or business directory around a certain location. Includes a gallery, news and listing pages. 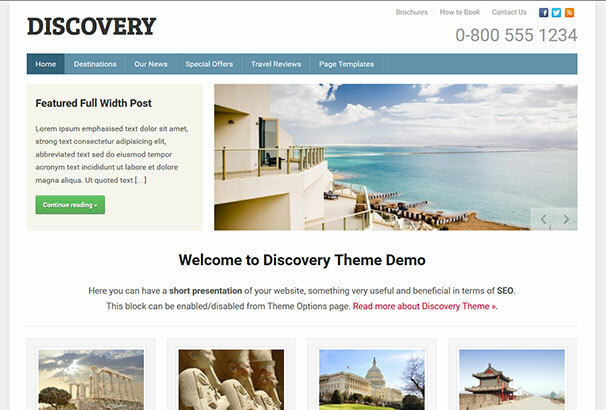 A complete travel agency WordPress theme – let users find tours, hotels, car rental and so on. The header on the homepage has space for striking images in a slider format. The content is then arranged in blocks letting the user click through to their chosen website section. 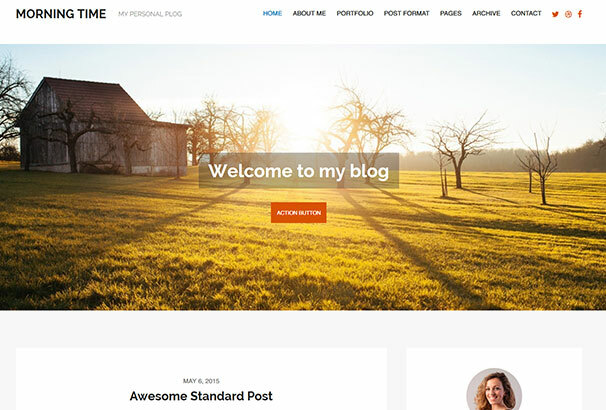 Old Oak is a Beautifully designed WordPress theme for a travel website, large homepage header area for displaying your logo and photos and full customization options, post formats, custom post types etc. 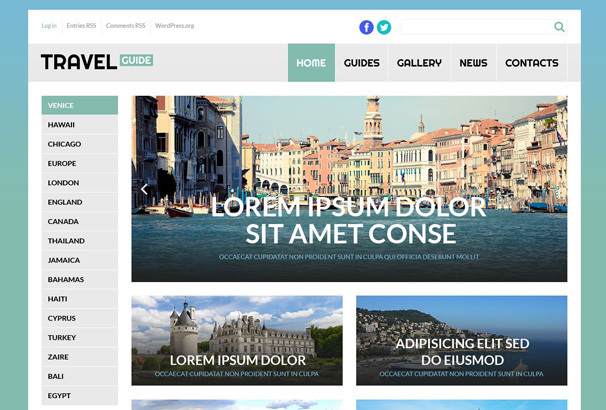 Travel Guide is a Responsive WordPress Theme perfect for your traveling website. It is a fully editable which allows you to customize most aspects of it, change colors, fonts, layouts and so on to fit your needs. 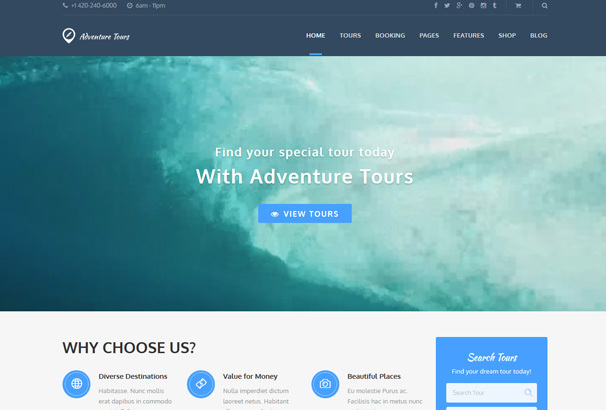 Adventure Tours is a WordPress theme for travel agencies and tour operators, it follows a business layout with space on the homepage for large photos, a services area, search box and other pages for listing your tours and booking options. Olympus Inn is a WordPress theme for Hotels and other hospitality based businesses. It is responsive and retina optimized so it will look good on all devices. It has some unique features such as dynamic weather reporting, customer testimonials, attractions, multi-lingual plugin support. 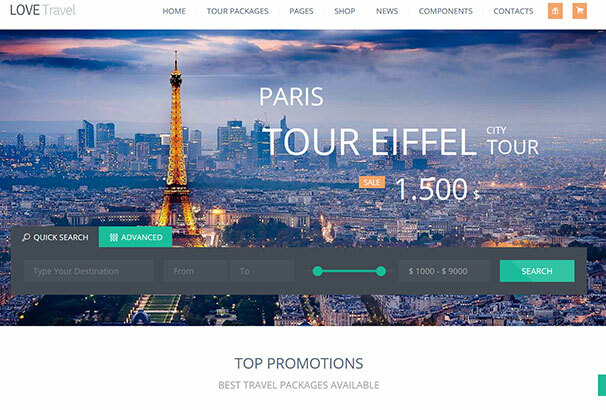 Tour Package is designed for Tour operators and allows you to define packages using the built-in custom post type. You can easily add locations and other pages such as about your company, testimonials, contact pages and so on and it also comes loaded with a number of shortcodes to help build custom pages. 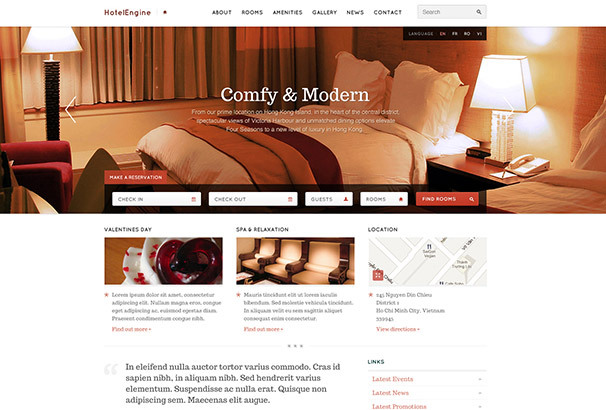 Classy is a theme which works with Hotel Engine, the best Hotel WordPress system available. It’s packed with loads of features and a beautiful design to help convert visitors into paying customers of your establishement. 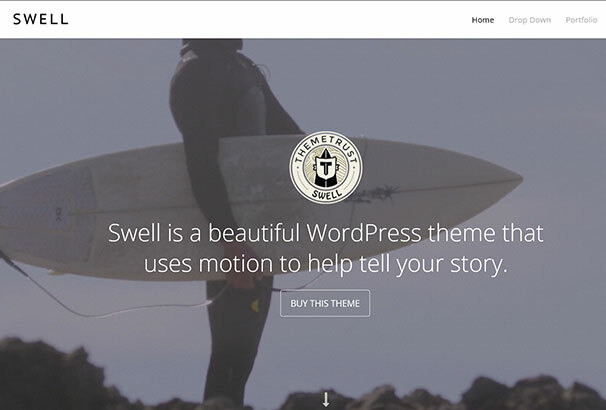 Get 15% off this theme with our Engine Themes Coupon Code. 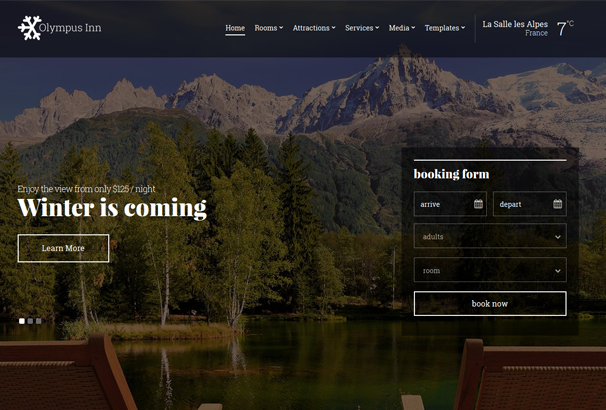 Comfy is another theme for Hotel Engine, it’s the complete package for Hotel websites, allowing guests to check availability of rooms online and make reservations using the booking system. Traveline is a theme for taking bookings – the homepage has a booking form where the user can choose their destination from the available options, search availability and then go on to book their hotel or travel online. 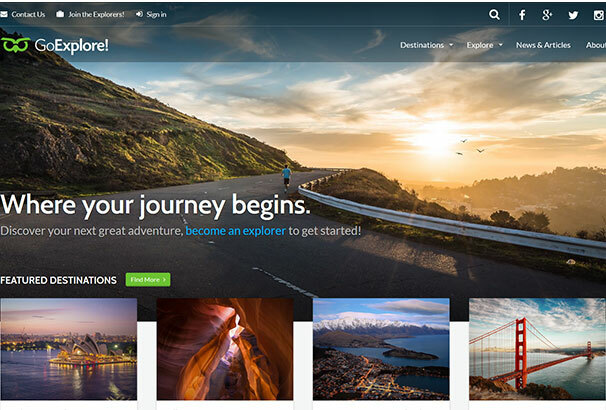 Go Explore is the complete theme for travel agencies, destinations, blogs or other related websites. 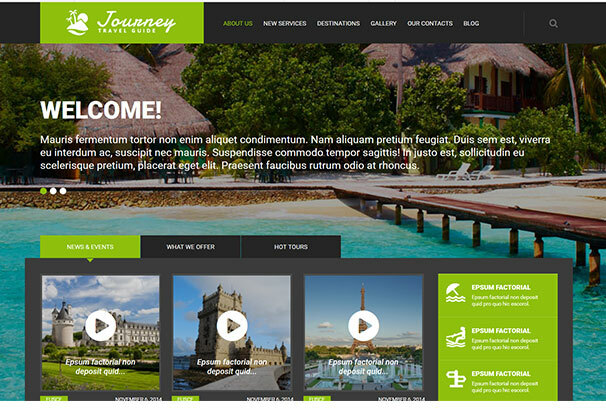 It has great modern styling, responsive design, social media tools, image galleries and more for creating travel-based websites. Love Travel is a Multi-Purpose theme for travel businesses. The homepage has a large image slidier with a search box overlaid on top. The search box allows you to search for a destination and define a price range. Underneath is space for top travel packages, at the bottom is a destination chooser with the number of destinations, tour packs, cruises etc displayed. 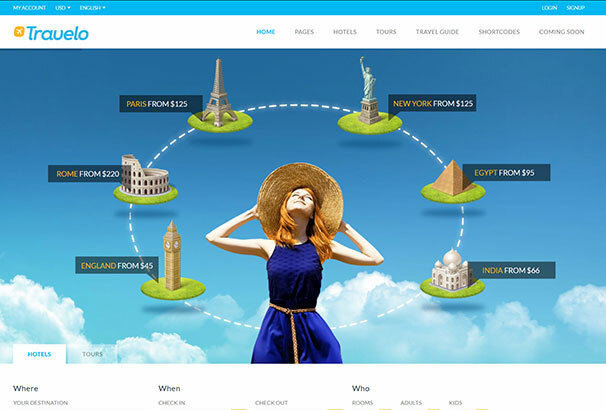 Traveler is the complete travel booking theme – it has 15 different demos for sites like hotel finder, car rental, tour listing, destination guide and so on. It was designed after research popular travel sites like booking.com, tripadvisor, yahoo travel, expedia, priceline, hotels.com, travelocity, kayak, orbitz, etc. 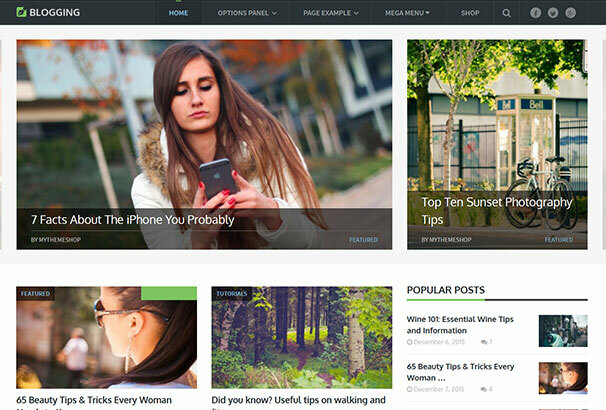 If you are after a large theme with a lot of customization options then this is the one to take a look at. 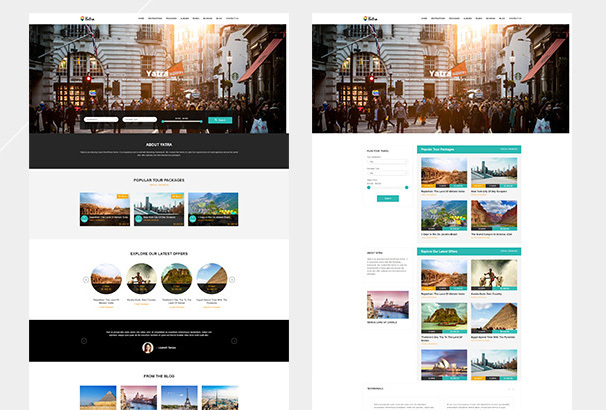 Yatra is a responsive WordPress theme that is suitable for travel companies. 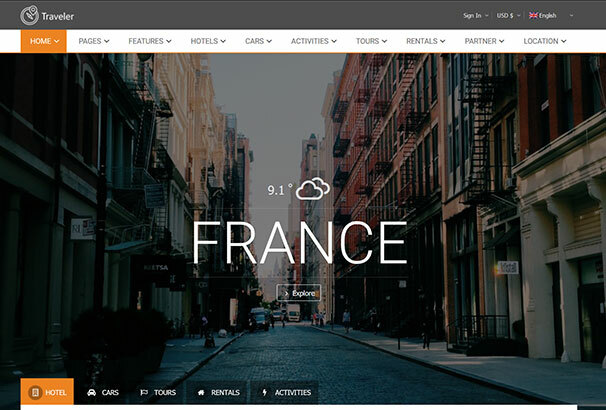 It has multiple layouts and lets you display different tour packages.Really nice design and grid layout for destinations and a detailed search module are included. Travelo comes packed with a lot of features and different demos and options for configuring different websites. It has its own booking system and also integrates with WooCommerce to handle payments online. It also includes user dashboard pages for managing their bookings. The themes listed in this section are suitable for creating a travel blog, where you could keep a record of your travels and update family and friends where you have been or you could create a blog around a certain destination, country or city. Travel Blog themes need good image support – that will be one of the key features of your website so we have chosen ones which display images well. 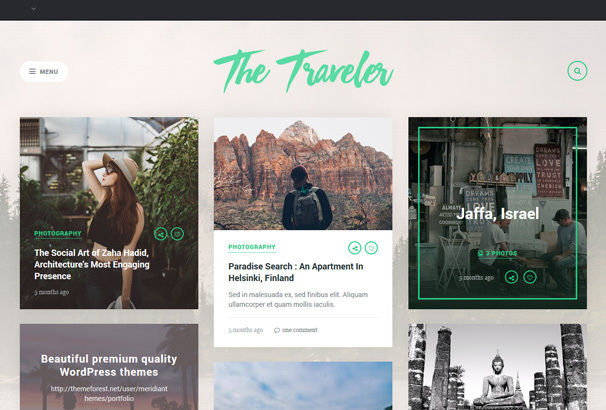 The Traveller is a great looking travel blog theme, it arranges your content in a grid on the homepage and allows you to use different post formats to post images, blog posts, quotes etc. 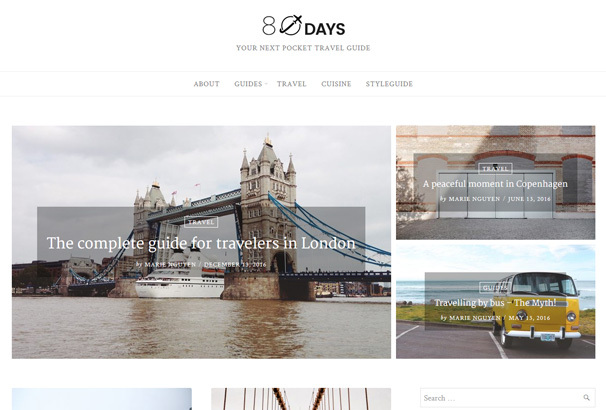 If you are a traveler or a travel agency who writes and shares your experience, the places you visited or the photos, then EightyDays is the best theme for you. 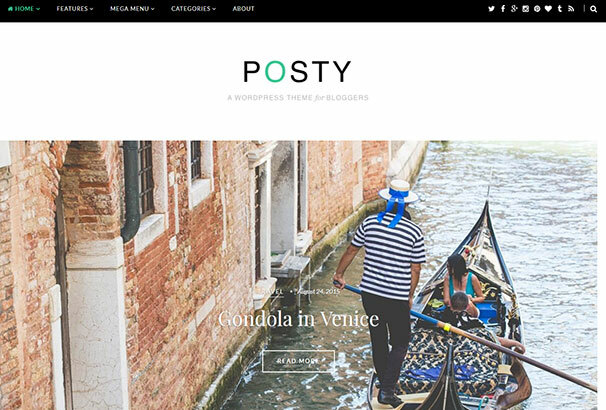 Posty is a fresh, customizable and professional WordPress blog theme. It’s perfect for your Food and Health, Travel and/or Lifestyle blog. Posty has have options to show your Archive/Post Listing in Standard, Grid or List style. 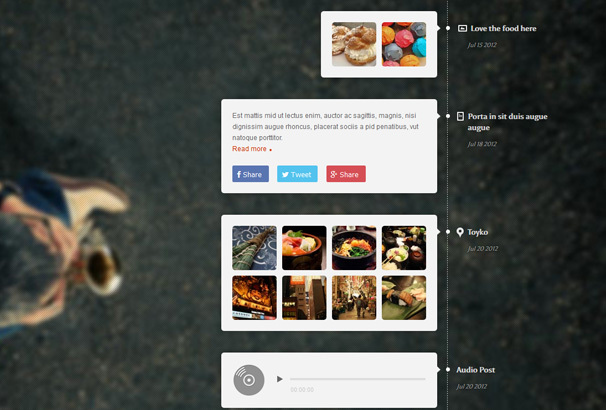 You can also choose between Full Width, Left Sidebar or Right Sidebar. Whether you’re a casual weekend explorer, an eco-tour business or a travel enthusiast living abroad — Adventure is an excellent solution for sharing and funding the journey. Looking for a blogger WordPress theme that creates a website for travel blog, that everyone would love to read? 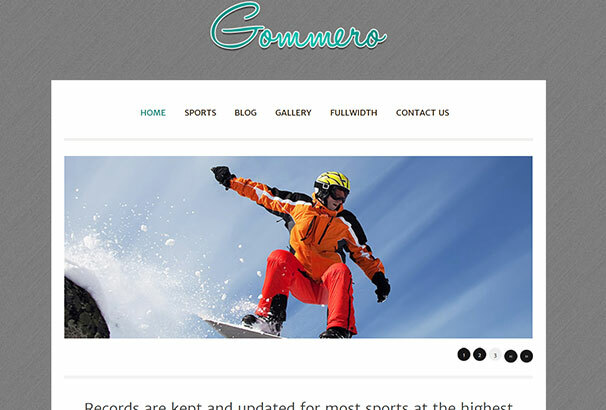 With Gommero travel blog theme, you can share memorable experiences with people, let them know about new places for travel.